What's better than buying the latest game in the multimillion-selling, world-conquering Call of Duty franchise? Getting the limited edition SteelBook with heaps of extra goodies and saving £40 in the process, that's what. You can get the Call of Duty: Ghosts deal over at Amazon, which is selling it at not much more than the standard game at £29.13 for PS3. That gives you a full digital version of the game along with a season pass (usually worth £35 alone) that includes 4 DLC map packs and a bonus team leader pack. 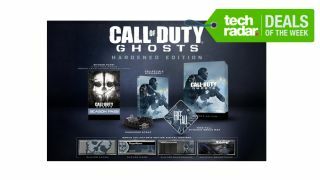 It also features a bundle of collectible physical items and a steel game case with premium artwork so make sure you don't miss out while it's still at this price, it usually costs over £70. And while our eyes are on gaming deals we couldn't help but get excited about this Sony PlayStation Wireless Stereo Headset 2.0. With 7.1 surround sound and optimised settings for games it's a great addition to your gaming setup. It looks pretty darn cool too. It comes out on Friday and you can pre-order yours today with a pre-order price guarantee from Amazon. That's what we call a good deal.